For some time, physicists have understood that all known phenomena in the Universe are governed by four fundamental forces. These include weak nuclear force, strong nuclear force, electromagnetism and gravity. Whereas the first three forces of are all part of the Standard Model of particle physics, and can be explained through quantum mechanics, our understanding of gravity is dependent upon Einstein’s Theory of Relativity. Understanding how these four forces fit together has been the aim of theoretical physics for decades, which in turn has led to the development of multiple theories that attempt to reconcile them (i.e. Super String Theory, Quantum Gravity, Grand Unified Theory, etc). However, their efforts may be complicated (or helped) thanks to new research that suggests there might just be a fifth force at work. In a paper that was recently published in the journal Physical Review Letters, a research team from the University of California, Irvine explain how recent particle physics experiments may have yielded evidence of a new type of boson. This boson apparently does not behave as other bosons do, and may be an indication that there is yet another force of nature out there governing fundamental interactions. The efforts that led to this potential discovery began back in 2015, when the UCI team came across a study from a group of experimental nuclear physicists from the Hungarian Academy of Sciences Institute for Nuclear Research. At the time, these physicists were looking into a radioactive decay anomaly that hinted at the existence of a light particle that was 30 times heavier than an electron. In a paper describing their research, lead researcher Attila Krasznahorka and his colleagues claimed that what they were observing might be the creation of “dark photons”. In short, they believed that they might have at last found evidence of Dark Matter, the mysterious, invisible mass that makes up about 85% of the Universe’s mass. This report was largely overlooked at the time, but gained widespread attention earlier this year when Prof. Feng and his research team found it and began assessing its conclusions. But after studying the Hungarian teams results and comparing them to previous experiments, they concluded that the experimental evidence did not support the existence of dark photons. Instead, they proposed that the discovery could indicate the possible presence of a fifth fundamental force of nature. These findings were published in arXiv in April, which was followed-up by a paper titled “Particle Physics Models for the 17 MeV Anomaly in Beryllium Nuclear Decays“, which was published in PRL this past Friday. Essentially, the UCI team argue that instead of a dark photon, what the Hungarian research team might have witnessed was the creation of a previously undiscovered boson – which they have named the “protophobic X boson”. Whereas other bosons interact with electrons and protons, this hypothetical boson interacts with only electrons and neutrons, and only at an extremely limited range. If such a particle does exist, the possibilities for research breakthroughs could be endless. Feng hopes it could be joined with the three other forces governing particle interactions (electromagnetic, strong and weak nuclear forces) as a larger, more fundamental force. Feng also speculated that this possible discovery could point to the existence of a “dark sector” of our universe, which is governed by its own matter and forces. If this should prove to be the case, then physicists may be closer to figuring out the existence of dark matter (and maybe even dark energy), two of the greatest mysteries in modern astrophysics. What’s more, it could aid researchers in the search for physics beyond the Standard Model – something the researchers at CERN have been preoccupied with since the discovery of the Higgs Boson in 2012. 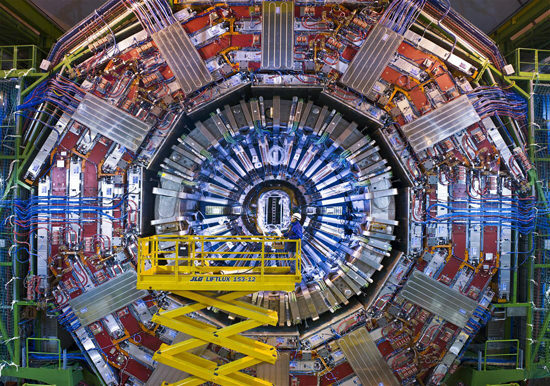 As the recent case involving CERN – where LHC teams were forced to announce that they had not discovered two new particles – demonstrates, it is important not to count our chickens before they are roosted. As always, cautious optimism is the best approach to potential new findings. Dr. Thad Szabo is a professor of physics and astronomy at Cerritos College. He’s also a regular contributor to many of our projects, like the Virtual Star Party and the Weekly Space Hangout. Thad has an encyclopedic knowledge of all things space, so we got him to explain a few fascinating concepts. In this video, Thad explains the strange mystery of dark energy, and the even stranger idea of the Big Rip. If we look at the expansion of the universe, at first it was thought that, as things are expanding while objects have mass, the mass is going to be attracted to other mass, and that should slow the expansion. Then, in the late 1990’s, you have the supernova surveys that are looking deeper into space than we’ve ever looked before, and measuring distances accurately to greater distances than we’ve ever seen before. Something really surprising came out, and that was what we’ll now use “dark energy” now to explain, and that is that the acceleration is not actually slowing down – it’s not even stopped. It’s actually getting faster, and if you look at the most distant objects, they’re actually moving away from us and the acceleration is increasing the acceleration of expansion. This is actually a huge result. One of the ideas of trying to explain it is to use the “cosmological constant,” which is something that Einstein actually introduced to his field equations to try to keep the universe the same size. He didn’t like the idea of a universe changing, so he just kind of cooked up this term and threw it into the equations to say, alright, well if it isn’t supposed to expand or contract, if I make this little mathematical adjustment, it stays the same size. Hubble comes along about ten years later, and is observing galaxies and measuring their red shifts and their distances, and says wait a minute – no the universe is expanding. And actually we should really credit that to Georges Lemaître, who was able to interpret Hubble’s data to come up with the idea of what we now call the Big Bang. So, the expansion’s happening – wait, it’s getting faster. And now the attempt is to try to understand how dark energy works. Right now, most of the evidence points to this idea that the expansion will continue in the space between galaxies. That the forces of gravity, and especially magnetism and the strong nuclear force that holds protons and neutrons together in the center of an atom, would be strong enough that dark energy is never going to be able to pull those objects apart. However, there’s a possibility that it doesn’t work like that. There’s actually a little bit of experimental evidence right now that, although it’s not well-established, that there’s a little bit of a bias with certain experiments that dark energy may get stronger over time. And, if it does so, the distances won’t matter – that any object will be pulled apart. So first, you will see all galaxies recede from each other, as space starts to grow bigger and bigger, faster and faster. Then the galaxies will start to be pulled apart. Then star systems, then planets from their stars, then stars themselves, and then other objects that would typically be held together by the much stronger forces, the electromagnetic force objects held by that will be pulled apart, and then eventually, nuclei in atoms. So if dark energy behaves so that it gets stronger and stronger over time, it will eventually overcome everything, and you’ll have a universe with nothing left. That’s the ‘Big Rip’ – if dark energy gets stronger and stronger over time, it will eventually overcome any forces of attraction, and then everything is torn apart. You can find more information from Dr. Thad Szabo at his YouTube channel.